Instructions: Click here to see a larger photo of this project. Card is 6 x 5". Score and fold 12 x 5 1/2" white cardstock at 6" on the long side. Using the largest tag die from the Album Tags and Accent Die, cut the card base. Make sure the left side of the die is placed just past the fold. Cut another piece of white cardstock and the plaid paper from the collection also with the largest tag die. Adhere these two pieces together using dries clear adhesive. Using the two largest tag dies, cut a frame from white cardstock. Cut the fan shaped die from the Frame a Card Leafy Borders die from white cardstock. Sponge both of these diecuts with dries clear adhesive and sprinkle with crystal ultrafine transparent glitter. Adhere the frame to the front as shown. Adhere the fan to back so that just part of it shows. Adhere this top tag to the card base. Cut another piece of the designer paper from the second largest tag die, ink with cobalt blue ink and adhere to the inside of the card. Diecut the eyelet die from white cardstock using the Album Tags and Accents Die set. 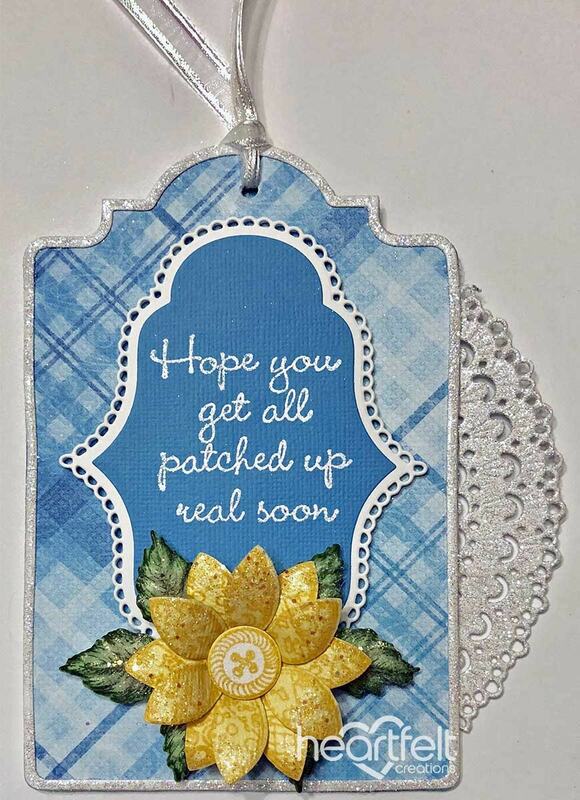 Stamp the sentiment on blue cardstock using VersaMark, sprinkle with WOW Sparkling Snow Embossing Glitter and heat set using the Heat It Tool. Diecut using the inside die from the same die set, adhere to the white diecut using dries clear adhesive and then adhere to the card base using dimensional tape. 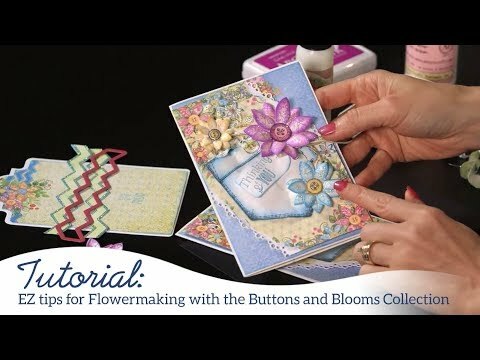 Stamp the buttons on white cardstock using Sunflower ink and diecut using the coordinating die. Stamp the largest Bloom on yellow cardstock using Sunflower Archival ink, diecut using the coordinating die, shape using the Deluxe Flower Shaping kit and adhere the two petals together to create one large flower, add a button to the center using a small dimensional dot and spray with Sparkle Sheer Shimmer Spritz. Sponge the petals with dries clear adhesive and sprinkle with Rajni Chawla's Crystal Clear glitter. 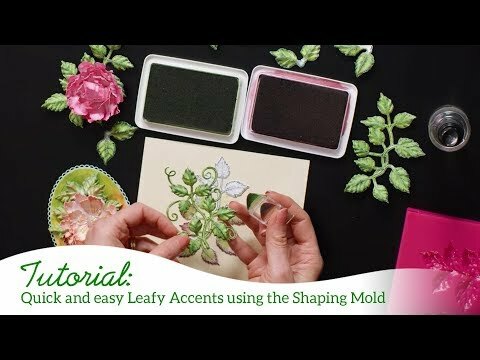 Stamp the Leafy Accents leaves on white cardstock using Archival Olive ink, color with the same ink, highlight with a little Berrylicious ink, diecut using the coordinating dies and shape using the Leafy Accents Mold. Spray with Sparkle Sheer Shimmer Spritz and let dry. Sponge with dries clear adhesive and sprinkle with Rajni Chawla's Crystal Clear glitter. Adhere the leaves and flower to the card base as shown using a hot glue gun. Punch a hole in the top of the card front and add a ribbon.